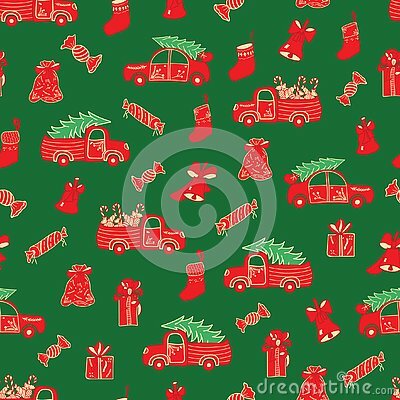 Vector green Christmas seamless pattern background with bells, stockings, gift boxes, and red trucks loaded with trees, candies and candy canes. Perfect for winter holidays gift wrapping, fabric. Christmas characters on City Map. Christmas and New Year delivery. Set of different silhouettes of delivery trucks on white background. Vector illustration. Christmas Market with food and hot drinks. Seamless vector pattern. Winter illustration. New Year`s and Christmas. Houses in the snow and red trucks with spruce trees.